Horizon 900 Series, Simpson Lawrence horizontal "free fall" Windlass on-deck power anchor lift. 12 V, Rocker switch, Used once; then sold the boat without it. As is. 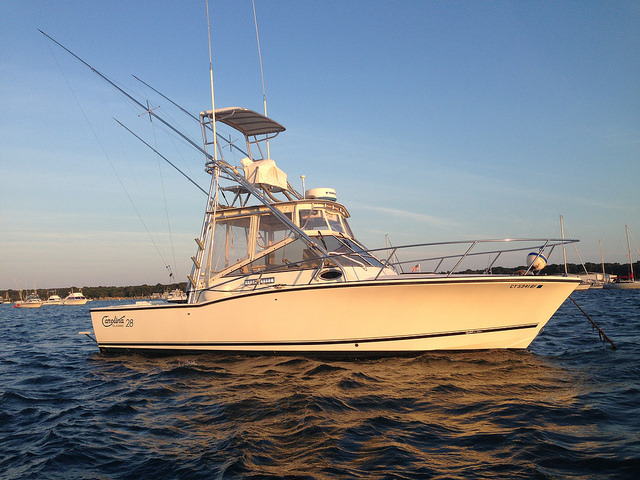 2000 Hunter 410 Sapphire is a one owner boat, used solely on the Chesapeake Bay. 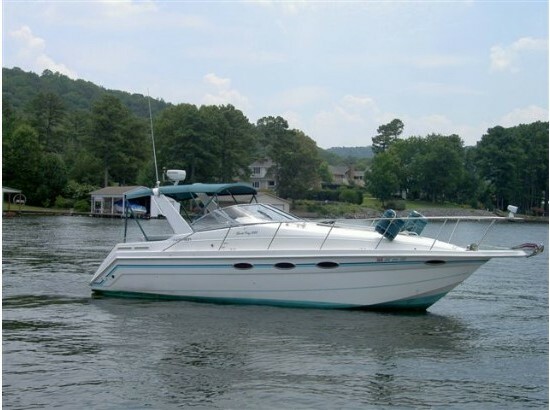 The Hunter 410 has a fabulous layout, ideal for a family as there is plenty of room to move around each other both on deck and down below and has great access to the water. Sapphire has the following equipment:Raymarine ST6001+ AutopilotRaytheon ST60 Wind, Depth and SpeedCockpit cushionsCustom cup holder on pedestalMarine Air Reverse Cycle AirconSimpson Lawrence electric windlassDouble anchor rollerInmast furling mainsailPerch seats on stern railCockpit showerWalk through transomArch rear of cockpit with travellerYanmar 50HP engine with 615 hoursKenmore 'dorm' fridge in salon.Hull waxed and bottom painted 8/16 Appointments necessary to view this boat. 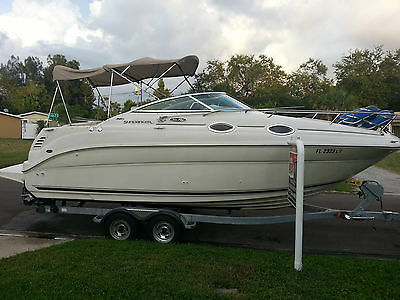 Selling now to a cash buyer who knows their vessels & ocean well; not challenged to realize a rare deal buy outright and make her whatever you want. I've lowered the price to sell now. 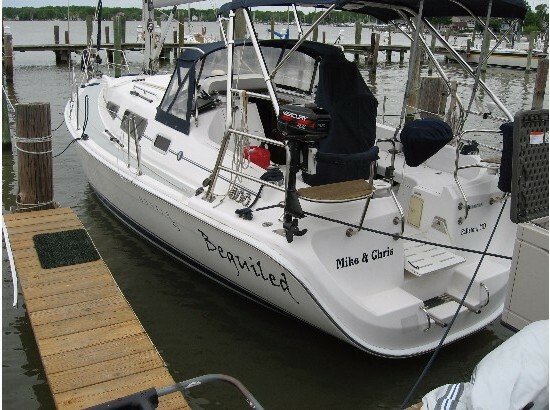 Once in a lifetime opportunity to own one of the finest cruising sailboats built for person looking to spend less upfront and fix her up to your own purpose. Vessel as is can make major crossing to Fiji or West Coast, currently sailing inter-island and at anchor in Hawaii. Great sailing boat, simple sail plan for ease of sailing. Vessel tracks well, very forgiving to inexperienced or rough water action. 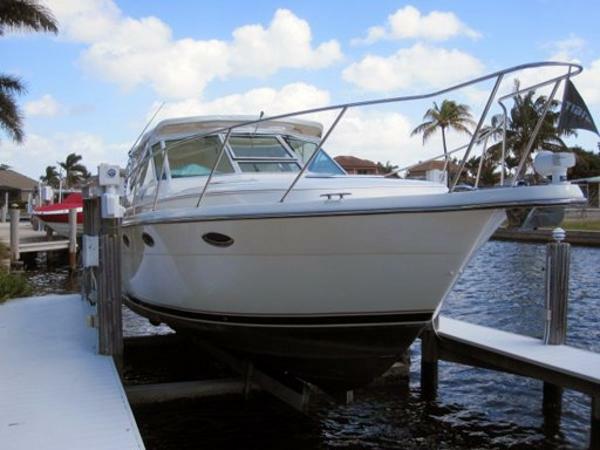 Great live aboard, large flush deck, center cockpit, raised aft cabin. 6'3" headroom average throughout. Midship main salon with sofa/double bed, galley. Forward unfinished but framed in double bed cabin, wash basin, storage area. Built in USA no inferior metals, craftsmanship or materials used as was common to similar Asian built vessels. This is a live to see another day serious blue water cruiser not a cookie cutter cheap build. Never had teak decks so deck is not compromised - has retained original strength, no hidden rot or leaks. Hull is 3/4" solid fiber reinforced plastic (FRP) that thickens at waterline and below to encapsulated full keel. Rare. Vessel requires TLC, cleaning & some project cosmetic work. Main engine not starting needs new starter, overhaul recommended. It is a boat for someone who has money to invest or who's hobbies include being handy. Serious inquiries only. Vessel is sold as is where is, free clear title through USCG Certificate of Documentation Sale/Transfer of Vessel notary and Bill of Sale. Cash, cashier's check or bank wire transfer both for deposit 10% and purchase within 7 days of our agreement. Skookum Center Cockpit Masthead Sloop 1972, full keel renowned Ed Monk design built by Skookum Marine Inc., Port Townsend, WA. Do research the value & uniqueness of full keel bulletproof hull era, top end designers & builders. Online you can find similar 47-53' Skookum vessels in better condition priced up to $549,000. There are several in the $80,000 range with the original old interior and engine that need to be redone, rebuilt or replaced. If you look on Yacht World, Sailboat listings, etc. you will find Skookum 47' to 53' vessels. 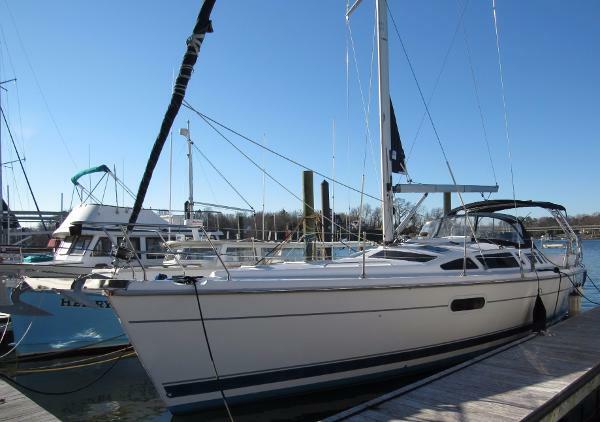 There is a 47' Custom Built Cutter Skookum for $549,000. Owners took the same 1970's hull to a boat builder for refit had everything inside topside redone. It's much more cost effective and a seaworthy vessel than new. S/V Aulani Aloha USCG Doc. # 1231261 with original build cert. - operational endorsements: Recreation, Registry for foreign waters, Coastwise for commercial passengers/cargo & fishery. Foreign built or State registered do not enjoy such liberties. LOA: 50', LOD 48', LWL: 38' Hull Speed: 8.5 knots Beam: 13' 6" Draft: 6' 6" Ballast: 11,500lbs; Displacement: 32,000 lb Internal volume: 1 ton equals 100 cubic feet - GT 29, NrT 26 Compare to other vessels. Hydraulic Windlass deck-mounted drum, pump clutch (new 2010) Simpson Lawrence Tiger 555 (2011 $1500) Anchor Rode - 66lb Bruce claw, 45lb Danforth; Chain 150' & 90' 3/8" G3/G4; 350' line Wagner hydraulic Ram, helm pump A2-W (new 2009) 44" Edson Destroyer Wheel (new 2009) Autopilot Hydraulic Comnav 1500/1510 with Fluxgate compass (new 2004 $2000) HRP100 Accu Steer Reverse Pumpset (new 2011 $2000) Large inboard hung spade rudder attached to keel, system serviced (2011), new cutlass (2011) 5 Batteries/2 banks - 350 amps, 220 amps (new 2014) 10 Amp Marine Battery Charger (new 2013) 2 Solar panels 80 (new 2011) & 100 watt (new 2013), controllers (new 2013), 200 Watt Invertors, DC/AC Circuit Break Panel Distribution, 3 Battery Selector Switches (new 2011), 75% of wiring (new 2011) all boat cable, marine grade Yanmar 2GMFL 5 kW diesel generator ($10,000 new), low hours, new 55 amp charger (2013) 1982 Ford Lehman 80 hp diesel main engine (rebuilt 2001). Gear Reduction 2:1. Fuel Tank 85 gallons, Dual Racor filters, booster fuel pump, SS Day Tank 10 gallons. Bronze Stuffing Box & Bearings (serviced 2011). Bronze thru hull ball valves (new 2011) 3 blade bronze propeller 22 X 15 LH, polished/balanced (2011); 1.5" SS Shaft Rule 12 VDC Bilge Pumps - 3500 gph (new 2011), 1100 gph (new 2015) 3 Fresh Water Tanks capacity 305 gallons; 12 VDC PUMP pressurized (new 2014); 10 gallon Hot water tank/heater 115 VAC Toyotami OM 22 (22,000 BTU) oil-diesel heater electronic ignition (new 2007), clean efficient no diesel smell. 3 Fire extinguishers, Flares, Eprib, Horseshoe life ring, 8 PFDs, Ships bell, barometer Galley stove propane 3 burner & 20lb aluminum tank, Microwave Oven, SS Sink, 12vDC Igloo Ice Chest Jabsco Marine toilet (new 2013), 30 gallon holding tank. Aluminum mast, boom, spars by Yacht Riggers (new 2002). SS Rigging 3/8" and 5/16" (new 2002), (reconditioned 2008, 2011) chain plates all above deck easy to inspect - very good condition, insulated backstay for SSB-HF radio, spinnaker/whisker pole Winches - 2x Barient #28 (dual), 1x #22 and 2x #20 (cleaned serviced 2015) Sails: Dacron main with 6 battens (serviced by SLO Sail & Canvas 2011) fair condition & 130% dacron Genoa with sail cover UV (new 2010) good condition, Profurl headstay system. 4" Gemini & 3" Tell Tale Compasses JRC LCD Radar 1500 MK II (new 2010 $2000) Furuno Echo Sounder FCV 620, bronze transducer (new 2011 $1500) WM VHF 600, new antennae (2015) Extensive haul out 2011 - Barrier paint 2 coats, 3 coats ablative antifouling, 2 coats 2 part marine exposy hull & decks. Edson cast aluminum tender davits, SS swim ladder and boarding rails Walkthrough Layout: Entry from cockpit to aft cabin 14' long by beam with queen size bed, enclosed head to port and vanity/nav area stbd. 7' long passageway forward with storage clothes hanging area to stbd can be converted to berth. Main engine and gen set center under cockpit easy access. Main Salon midship 10' by 13', galley 9'x5' port side opposite machinery compartment into main salon. Forward space 14' to chain/rope locker. Stairwell entry exit to flush deck port side. Starboard side has thru hull fittings for second head original with construction. There is a framed in double bed to starboard with port side shelving for storage. Large Cockpit area 8' by 7' designed so one can easily add a pilothouse. Pictures of haul out, prop/stern/rudder are from several years past. Interior, deck, sailing and at anchor or mooring pics 2015-2016. See videos at my u tube channel Ocean Maverick for footage of history, underway, etc. 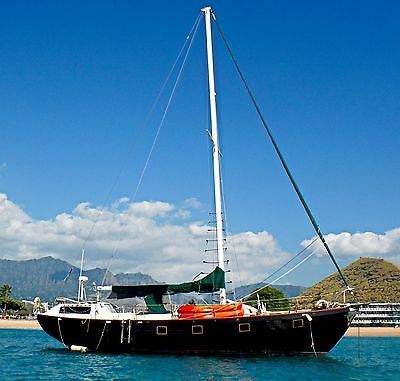 I have other helpful links at sail boat listings and other, do ask. Rare original insulation core high quality dense laid up inside of hull 1 1/14" with 1/8" FRP barrier inside to glass in any type of interior and use. Best type for heating cooling temperature control inside and noise reduction. Deck is 1 1/2" 2 layers solid and cored FRP laminates. I've lived on her last five years dockside, underway, on the hard, at anchor and sailing cruising often solo across 20,000 miles of ocean from Seattle down West Coast thru Hawaii into South Pacific & back to Hawaii. I had a two phase plan to refit, fix her up allowing me to enjoy cruising the Pacific Ocean and isles. I completed phase one but developed a condition two years past that now forces me to sell. An alternative to paying $150,000 for a similar in excellent condition or $80,000 with a running old engine worn and soon to fail or mandates a rebuild. Is to buy cheap get a great hull, good rigging & sail gear, anchoring system, versatile spacious interior to be used as is & continue remodeling or redo to your own liking while enjoying life aboard and/or sailing. Or an alternative housing scenario. That alternative is this. The 2010 survey put the boat at a $400,000 replacement cost, a $115,000 - $140,000 refit complete value and $85,000 market value. The prior owner needed a survey for bank loan and insurance. 2010 survey available upon request plus 2012 addendum. You want this, she will take you anywhere and accommodate your wildest dreams. 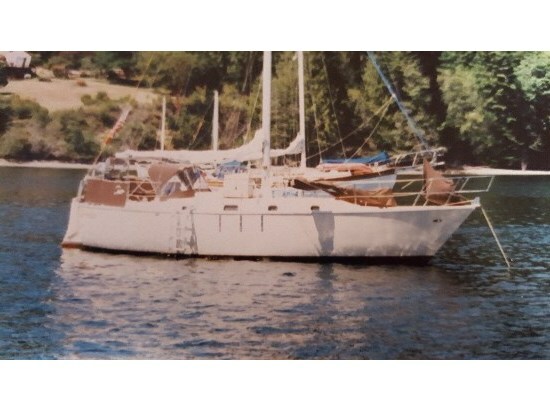 Once in a lifetime opportunity to own one of the finest cruising sailboats built for person looking to spend less upfront and fix her up to your own purpose. Vessel as is can make major crossing to Fiji or West Coast, currently sailing inter-island and at anchor in Hawaii. Great sailing boat, simple sail plan for ease of sailing. Vessel tracks well, very forgiving to inexperienced or rough water action. Great live aboard, large flush deck, center cockpit, raised aft cabin. 6'3" headroom average throughout. Midship main salon with sofa/double bed, galley. Forward unfinished but framed in double bed cabin, wash basin, storage area. Built in USA no inferior metals, craftsmanship or materials used as was common to similar Asian built vessels. This is a live to see another day serious blue water cruiser not a cookie cutter cheap build. Never had teak decks so deck is not compromised - has retained original strength, no hidden rot or leaks. Hull is 3/4" solid fiber reinforced plastic (FRP) that thickens at waterline and below to encapsulated full keel. Rare. Vessel requires TLC, cleaning & some project cosmetic work. Main engine not starting needs new starter, overhaul recommended. It is a boat for someone who has money to invest or who's hobbies include being handy. Price reflects that and need to sell NOW. Serious inquiries only. Reasonable offers considered. Motivated Seller for empowered motivated Buyer. 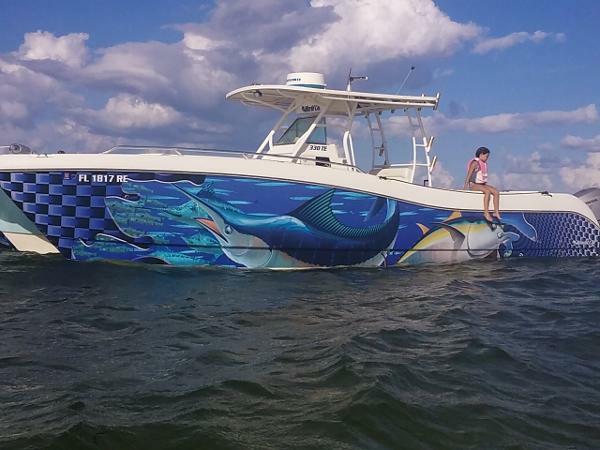 Open to trade into smaller 31-38' vessel with cash. Vessel is sold as is where is, free clear title through USCG Certificate of Documentation Sale/Transfer of Vessel notary and Bill of Sale. Skookum Center Cockpit Masthead Sloop 1972, full keel renowned Ed Monk design built by Skookum Marine Inc., Port Townsend, WA. Do research the value & uniqueness of full keel bulletproof hull era, top end designers & builders. Online you can find similar 47-53' Skookum vessels in better condition priced up to $549,000. There are several in the $80,000 range with the original old interior and engine that need to be redone, rebuilt or replaced. If you look on Yacht World, Sailboat listings, etc. you will find Skookum 47' to 53' vessels. 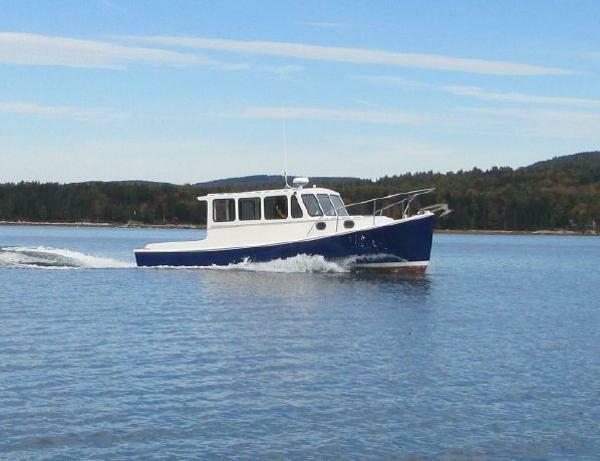 There is a 47' Custom Built Cutter Skookum for $549,000. Owners took the same 1970's hull to a boat builder for refit had everything inside topside redone. It's much more cost effective and a seaworthy vessel than new. 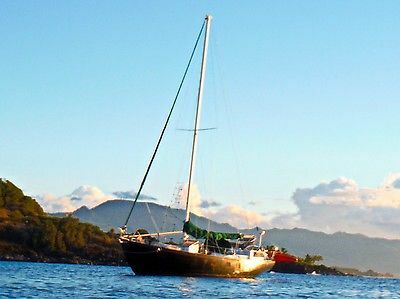 S/V Aulani Aloha USCG Doc. # 1231261 with original build cert. - operational endorsements: Recreation, Registry for foreign waters, Coastwise for commercial passengers/cargo & fishery. Foreign built or State registered do not enjoy such liberties. LOA: 50', LOD 48', LWL: 38' Hull Speed: 8.5 knots Beam: 13' 6" Draft: 6' 6" Ballast: 11,500lbs; Displacement: 32,000 lb Internal volume: 1 ton equals 100 cubic feet - GT 29, NrT 26 Compare to other vessels. Hydraulic Windlass deck-mounted drum, pump clutch (new 2010); Simpson Lawrence Tiger 555 (2011 $1500) Anchor Rode - 66lb Bruce claw, 45lb Danforth, 44lb Delta; Chain 150' & 90' 3/8" G3/G4; 350' line Wagner hydraulic Ram, helm pump A2-W (new 2009) 44" Edson Destroyer Wheel (new 2009) Autopilot Hydraulic Comnav 1500/1510 with Fluxgate compass (new 2004 $2000) HRP100 Accu Steer Reverse Pumpset (new 2011 $2000) Large inboard hung spade rudder attached to keel, system serviced (2011), new cutlass (2011) 5 Batteries/2 banks - 350 amps, 220 amps (new 2014) 10 Amp Marine Battery Charger (new 2013) 2 Solar panels 80 (new 2011) & 100 watt (new 2013), controllers (new 2013), 200 Watt Invertors, DC/AC Circuit Break Panel Distribution, 3 Battery Selector Switches (new 2011), 75% of wiring (new 2011) all boat cable, marine grade Yanmar 2GMFL 5 kW diesel generator ($10,000 new), low hours, new 55 amp charger (2013) 1982 Ford Lehman 80 hp diesel main engine (rebuilt 2001). Gear Reduction 2:1. Fuel Tank 85 gallons, Dual Racor filters, booster fuel pump, SS Day Tank 10 gallons. Bronze Stuffing Box & Bearings (serviced 2011). Bronze thru hull ball valves (new 2011) 3 blade bronze propeller 22 X 15 LH, polished/balanced (2011); 1.5" SS Shaft Rule 12 VDC Bilge Pumps - 3500 gph (new 2011), 1100 gph (new 2014) 3 Fresh Water Tanks capacity 305 gallons; 12 VDC PUMP pressurized (new 2014); 10 gallon Hot water tank/heater 115 VAC Toyotami OM 22 (22,000 BTU) oil-diesel heater electronic ignition (new 2007), clean efficient no diesel smell. 3 Fire extinguishers, Flares, Eprib, Horseshoe life ring, 12PFDs, Ships bell, barometer Galley stove propane 3 burner & 20lb aluminum tank, Microwave Oven, SS Sink, 12vDC Igloo Ice Chest Jabsco Marine toilet (new 2013), 30 gallon holding tank. Aluminum mast, boom, spars by Yacht Riggers (new 2002). SS Rigging 3/8" and 5/16" (new 2002), (reconditioned 2008, 2011) chain plates all above deck easy to inspect - very good condition, insulated backstay for SSB-HF radio, spinnaker/whisker pole Winches - 2x Barient #28 (dual), 1x #22 and 2x #20 (cleaned serviced 2015) Sails: Dacron main with 6 battens (serviced by SLO Sail & Canvas 2011) fair condition & 130% dacron Genoa with sail cover UV (new 2010) good condition, Profurl headstay system. 4" Gemini & 3" Tell Tale Compasses JRC LCD Radar 1500 MK II (new 2010 $2000) Furuno Echo Sounder FCV 620, bronze transducer (new 2011 $1500) WM VHF 600, new antennae (2015) Extensive haul out 2011 - Barrier paint 2 coats, 3 coats ablative antifouling, 2 coats 2 part marine exposy hull & decks. Edson cast aluminum tender davits, SS swim ladder and boarding rails Walkthrough Layout: Entry from cockpit to aft cabin 14' long by beam with queen size bed, enclosed head to port and vanity/nav area stbd. 7' long passageway forward with storage clothes hanging area to stbd can be converted to berth. Main engine and gen set center under cockpit easy access. Main Salon midship 10' by 13', galley 9'x5' port side opposite machinery compartment into main salon. Forward space 14' to chain/rope locker. Stairwell entry exit to flush deck port side. Starboard side has thru hull fittings for second head original with construction. There is a framed in double bed to starboard with port side shelving for storage. Large Cockpit area 8' by 7' designed so one can easily add a pilothouse. Pictures of haul out, prop/stern/rudder are from several years past. Interior, deck, sailing and at anchor or mooring pics 2015-2016. See videos at my you tube channel Ocean Maverick for footage of history, underway, etc. Rare original insulation core high quality dense laid up inside of hull 1 1/14" with 1/8" FRP barrier inside to glass in any type of interior and use. Best type for heating cooling temperature control inside and noise reduction. Deck is 1 1/2" 2 layers solid and cored FRP laminates. I've lived on her last five years dockside, underway, on the hard, at anchor and sailing cruising often solo across 20,000 miles of ocean from Seattle down West Coast thru Hawaii into South Pacific & back to Hawaii. I had a two phase plan to refit, fix her up allowing me to enjoy cruising the Pacific Ocean and isles. I completed phase one but developed a condition two years past that now forces me to sell. An alternative to paying $150,000 for a similar in excellent condition or $80,000 with a running old engine worn and soon to fail or mandates a rebuild. Is to buy cheap get a great hull, good rigging & sail gear, anchoring system, versatile spacious interior to be used as is & continue remodeling or redo to your own liking while enjoying life aboard and/or sailing. Or an alternative housing scenario. That alternative is this. The 2010 survey put the boat at a $400,000 replacement cost, a $115,000 - $140,000 refit complete value and $85,000 market value. The prior owner needed a survey for bank loan and insurance. 2010 survey available upon request plus 2012 addendum.